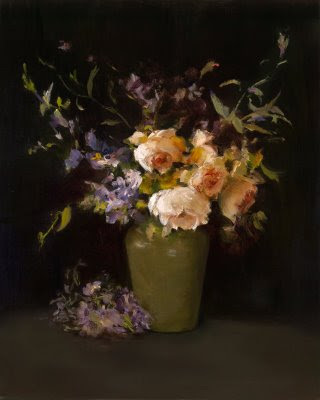 Every year I bring a collection of flowers from our garden to the Scottsdale Artists' School to share and to make my still life arrangement for a workshop with Sherrie McGraw. This year was my fourth year to study with her. Sherrie is truly a master artist and teacher. I have been very fortunate to study from her. Many of Sherrie's students return every year, without fail, for her workshops. Since most of the fellow artists travel from all parts of the country, they are often waiting for these roses to compose their set-ups. I love sharing them. As it is, these roses are a dickens to paint...so we all come away with a lot learned. Thankfully, the 'Abraham Darby' bushes are usually in full bloom when Sherrie comes to town in the spring. They make exquisite bouquets...very frangrant. If you like to grow roses and have lots of room for one of these Austin roses, the 'Abraham Darby' rose is a real winner.